It is surprising how quickly a spot fix can happen. Even the planning for it! :). On Jan 25th, the TUI group chatted about the fact that it was tradition to do a Spot Fix every Republic Day. Well, Whitefield has enough spots and more than enough enthusiasts wanting to make a difference. So just like that, it was decided. Not knowing how many folks would show up, we chose a simple project. One we had done before. 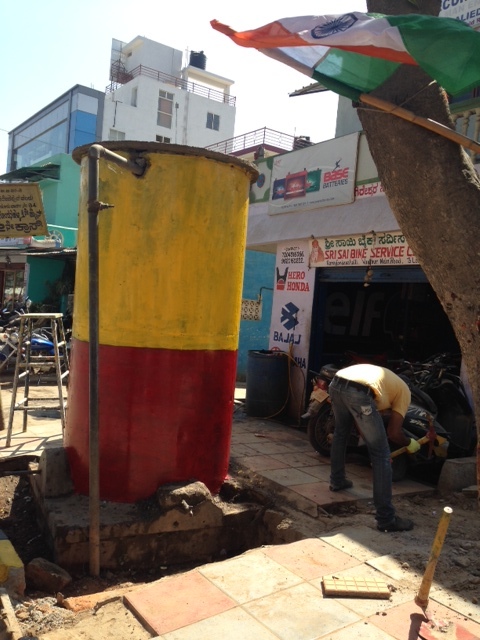 The Project: A Water tanker that sits bang on the pavement, its girth leaving little room for pedestrians. And oh, that little room too is taken up by the mechanic shop who parks his customers’ “to be repaired” vehicles on the pavement. The Water tanker provides water to a group of small homes nearby. 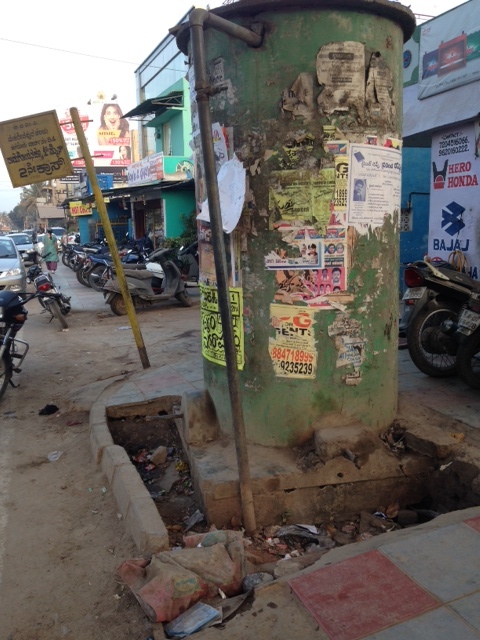 It seems to have sunk into the pavement, and right around the two taps is filth. Hardly one where you’d want to get your water from..
At the appointed time ie 10 am , a group of gigly girls showed up! Hardly who we expected but of course more than welcome. A mum thought it would be a great exposure for the school kids celebrating a child’s birthday. And so it was. Nothing like enthusiastic children going at it with gusto. An hour later, things looked much better and we got a closer look at problems that hid behind the ugliness. Broken Pavement tiles and the messy area around the taps. DNR Constructions Stepped up to the plate and said, they would take care of it! Thats it. Thats all it took folks. 1.5 hours, folks from all walks of lives, camraderie on the street and an impactful change. Well, for the non believers, please come and take a look at the “Ramagondanahalli fix” we did in early September 2013. It remains spotless. Its all about ownership afterwards. Those that ply this stretch MUST own the maintenance. It means, checking in, asking who dared dump trash or stick a poster. Actively removing it, building local friends and in general showing that you care..
Water tank after citizen effort but before DNR completion.